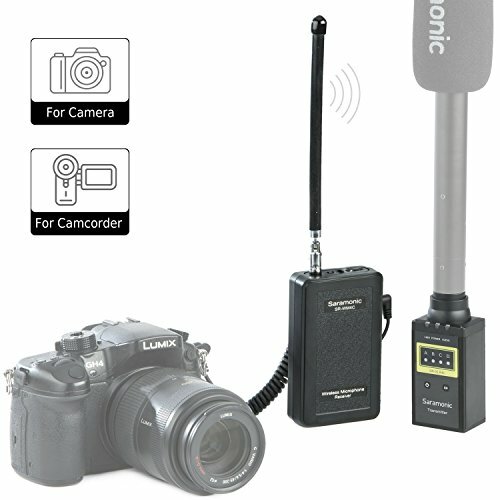 The WM4CB Wireless Microphone transmitter with Receiver from Saramonic includes TX-XLR4C Portable XLR Plug-on Transmitter unit and the SR-WM4C RX wireless portable recevier unit. For DSLR Camera / Video Camcorder , Compatible with Canon / Nikon / Sony / Panasonic / BlackMagic / Zoom / Tascam / Roland. The TX-XLR4C is a plug-on transmitter designed to provide reliable and versatile wireless transmission of any XLR microphone (sold separately),to Saramonic's SR-WM4C advanced wireless microphone system. The rugged, metal-bodied transmitter supplies 48V phantom power over its XLR 3-pin connector and powered by a pair of AA batteries. The WM4C RX Receiver is lightweight and easy to use - offering ultimate flexibility without sacrificing high-quality audio. The Receiver unit come with a detachable Camera Mounting Shoe,The flexible volume controls enable further optimization of the signal. The 3.5mm headphone jack allows you to easily monitor your signal, it is very helpful in film making, broadcast interview and business presentations. The Receiver unit is ruggedly built and powered by a pair of AA batteries. Receiver Dimensions : 4"x 2.5" x 1.75"
Trasmitter Unit Dimensions: 4.8" x 1.85" x 1.25"